In the night a hare was leaping like the last white song of winter over darkened hills. It had a smile in its eyes, shining, brightly shining. It had the moon hanging from its long left ear, swinging, slowly swinging. And the moon was shadowed with hare memories of wild grass, warm earth. And the smile was a tale untold. And where the hare leapt, flowers grew - small heirlooms of the winter, given over to the new season. In a house in quiet darkness, a woman was watching the lyrical turn of the world. She had stars in her tea and honey in her comfortable silence. And the honey stuck to her tongue like old bee dreaming. And the tea tasted wild. In the morning she would go out to gather white flowers, grieving winter, and when she came home she would leave the door open to let summer in. but this picture was found after the story was written. 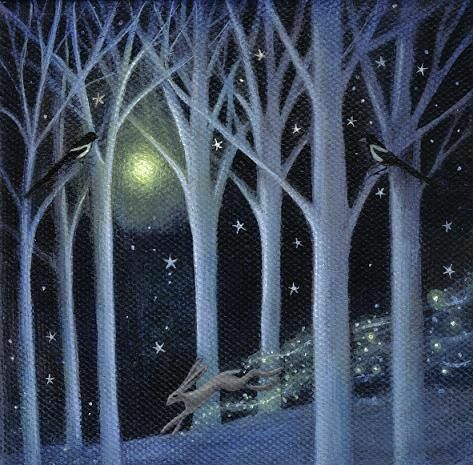 Love the description of the hare with the moon swinging from its ear...and honey like old bee dreaming...such magical and comforting images. Love this so very much. And I love her artwork as well. As you let summer in I wake up to frost on the ground. Wishing you a beautiful summer. Grieving winter... I have never thought of it that way before!